Mirth filled our senses as the curly-haired, little girl glided down slope on the bark of the paper tree. 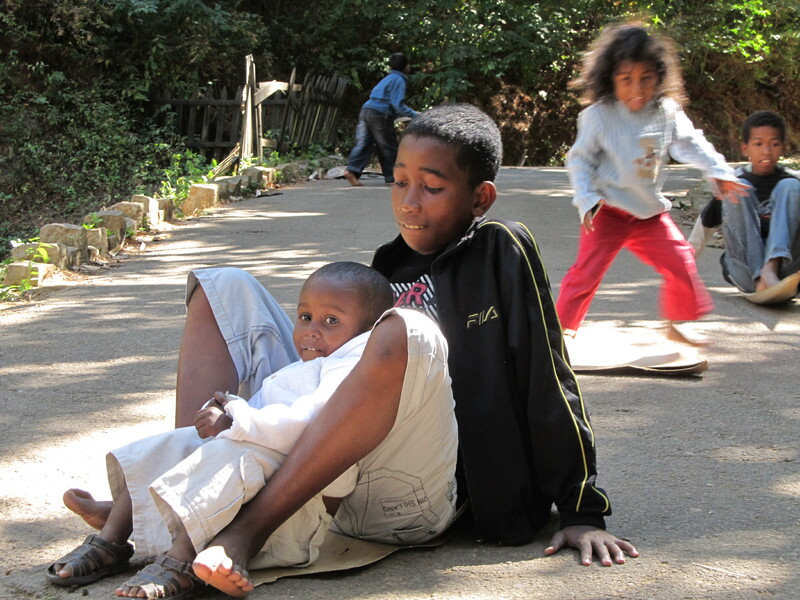 Another pre-teenager, rested his chest on a similar make shift skateboard and slithered downhill. One more of them sat a jubilant toddler in front of him on a dried palm leaf before they rolled down. They were a gang of five children, probably of the zoo workers. No sooner had their rudimentary skateboards stopped than they would pick it up and scamper up slope. As they rushed down, “Monsieur…” the children would shout, vying for our attention. 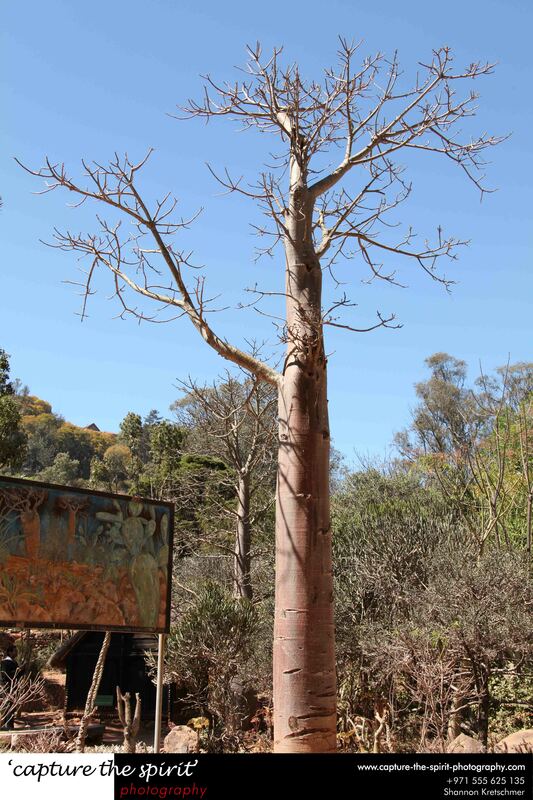 The slow gradient was on an asphalt road, which probably leading to the employee’s residences, was at the far end of the Tsimbazaza Zoo – Antananarivo. We stood on that road, watching the free show after visiting the animals. “There he is”, my friend Shannon exclaimed. We faced an island compound of Ring Tailed Lemurs. Their black rimmed piercing eyes, gave them a certain aura of arrogance. Their ringed tails, which gives them their name, reminded me of the pelt flashing women of 1920s. These lemurs climbed up and down the logs in their enclosures. Several times, they stared through us, to remind us of our insignificance. Shakespeare might as well have written, “Vanity, thy name is Ring-Tailed Lemur”. Later on, we spotted a Foosa (from mongoose family), the predator of lemurs. It was fast pacing the room-sized cage and clearly felt out of place. India’s National bird, the peacock had been lucky to have an open pen. 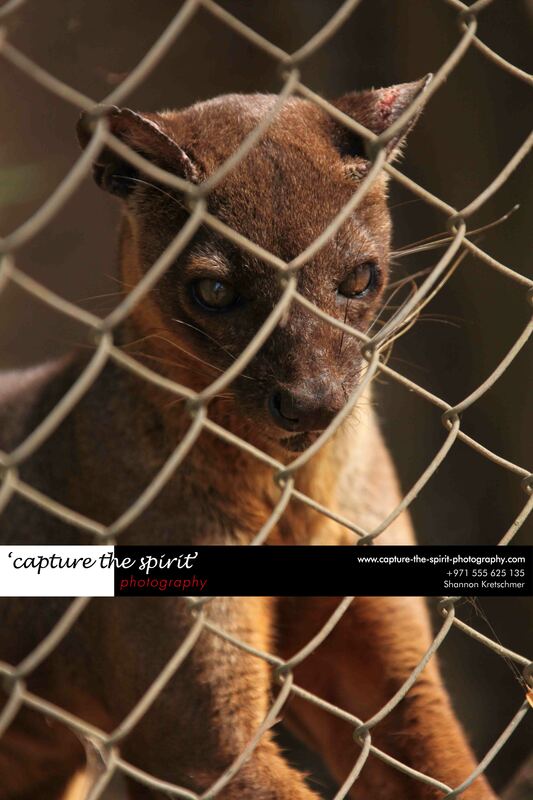 While exploring, we also came across cages with Red-Bellied Lemurs, Red Ruffed Lemurs, Blue-eyed Black Lemurs, Crowned Lemurs and Black Lemurs. “Monsieur, do you want to feed the lemurs?” proposed an approaching handler. So saying, we followed the zoo-keeper. It was nearly noon and was time to feed the lemurs. We felt special (read rich) to have an opportunity of a private meeting. Of course, the lemurs we were to visit were not the blue-blooded King Julians. These lemurs were in big cages arranged around a central feeding space. We entered the heart of an enclosure. The handler opened the cages one at a time. While we fed a few lemurs, another zoo-keeper got us a hollow bamboo piece. “Mouse Lemur”, he explained. We peeped in to see two dark-brown marbles gawking back at us. It quickly transported us back to the Night Safari in Mantadia National park, where our lovely guide, Aina had whispered pointing at a bush, “Morse lemur”! Shannon heard her say, “More slimmer!”. We had a debate over the tiny nocturnal lemur’s nomenclature. It was the next day when we were at the information centre in Mantadia National park that we realised that we both were wrong and the animal was called “Mouse Lemur”. We blamed our guide’s thick French accent for our ignorance. Back at the zoo, the handlers had stirred a mouse lemur to impress us! It was unnecessary, as after the feeding session we strolled into a dark section, which displayed numerous nocturnal fauna, including several mouse lemurs and the woodpecker in the world of lemurs, Aye-Aye. Someone called out in the background. It was a signal for the children to head home. We must have spent at least an hour watching them play with their simple toys. Strangely, I felt serene. I am glad that it was our first stop in the city. The zoo might not be in best-kept state but it sure does capture some essence of the nation, it even has a few iconic baobab trees! 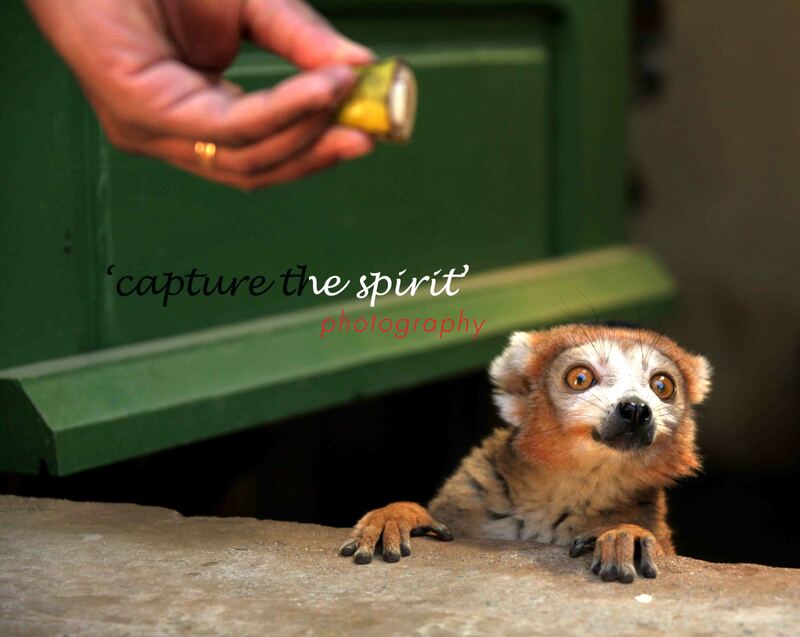 This entry was posted in Travel and tagged #foosa, #KingJulian, #Lemurs, #mouselemur, #ringtailedlemur, Antananarivo. Bookmark the permalink. your writings are lively.keep posting. 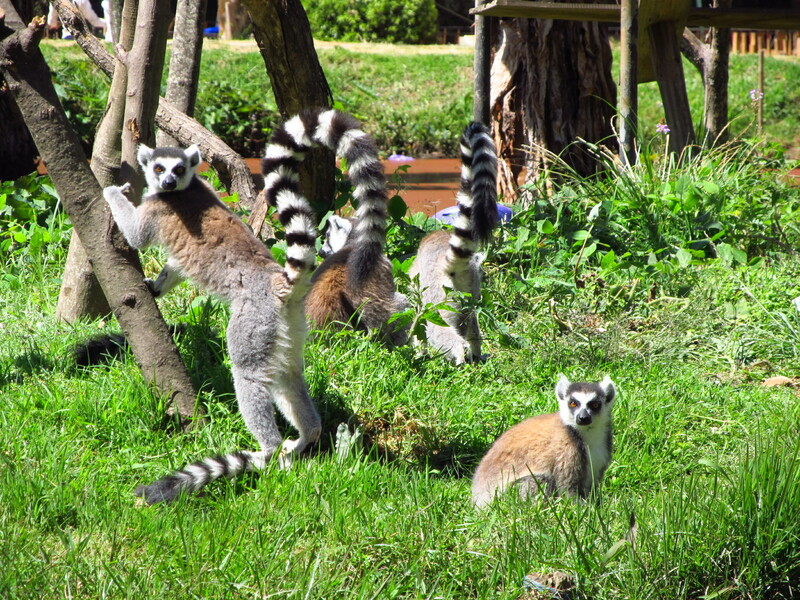 Thanks a lot…its the lemurs…they make brilliant muses! Bravo.Your writing made me feel as if I privately met Lemurs. My favorite line”We felt special (read rich) to have this opportunity of a private meeting”.